This group of shrimps includes Stenopus hispidus (Red and White Banded Coral Shrimp), S. scutellatus (Golden Coral Shrimp), S. zanzibaricus (Yellow Banded Coral Shrimp), S. tenuirostris (Blue or Purple Banded Coral Shrimp). Coral Banded Shrimps, and Banded Prawns. The Coral Banded Shrimp species vary in size from two to four inches in length with the male being the smaller of a mated pair. Tropical seas throughout the Indo-Pacific region and the Caribbean. 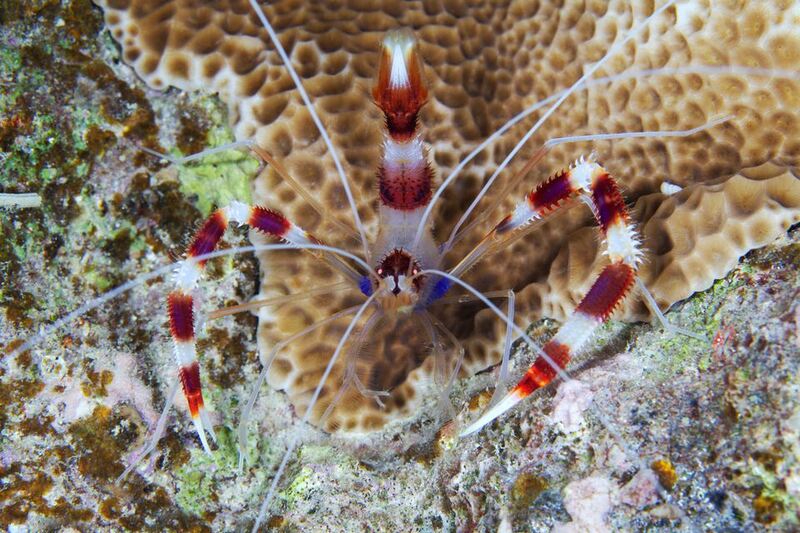 All Banded Coral Shrimps are marked with the characteristic bright red and white bands on their body and pincer claws, with the legs and antennae being white, except for the S. zanzibaricus species which are red. The front pair of legs are equipped with as pair of pincers which are larger than the pincers on the second pair of legs. The third pair of legs have no pincers. The Coral Banded Shrimp will regrow lost legs during its next molt. Coloration of the shrimp's carapace is where species differ as the S. hispidus is white. Stenopus hispidus gets along well with most fish and invertebrates (see exceptions, below) in an aquarium. However, triggerfish and many eels will dine on Coral Banded Shrimp when given the opportunity. In the wild, this shrimp prefers to live in caves and on the bottom of overhangs and will actively clean fish, when presented with parasites. In the wild, the Coral Banded Shrimp is nocturnal, hiding under ledges and in caves during the day and feeding at night. These shrimps live in monogamy and are somewhat territorial, defending an area of one to two meters in diameter against other crustaceans and in particular other Coral Banded Shrimps. If another Coral Banded Shrimp enters its territory, it will defend it, with one or the other shrimp losing legs and pincers in the battle that will follow. During mating the male will first display a courtship dance in front of the female. The male then transfers a sperm sack to the freshly moulted female which soon will inseminate the eggs and stick them to the abdominal legs. The young hatch after 16 days. The hatchlings will be attached to their mother for about six weeks before they detach, float to the surface of the water and become part of the plankton and drifting in the ocean currents. After some weeks and several moults the young descend from the plankton and settle to the bottom and find a dark place to hide. The Coral Banded Shrimp may live 2-3 years, sometimes longer. Back when we used to collect and ship tropical fish on the island of Moloka'i, we always knew that we could find Coral Banded Shrimp in numbers at night, hanging on the vertical walls of the wharf. If we needed mated pairs (in high demand on the Mainland) we would have to find pairs of shrimp that were within a foot or so from each other. We would collect them and keep them together together in a cup before shipping them the next morning. It seems that the Coral Banded Shrimps mate at a young age and when one of the pair becomes lost the remaining shrimp will not accept another mate. Stenopus hispidus is a scavenger by nature and will take most meaty foods. Will readily devour Polychaete Worms when they are present. In the wild, this shrimp will feed on algae, detritus and carrion as well as parasites which it picks from fish. Is aggressive towards other shrimp and crustaceans. It also preys on worms, snails and small hermit crabs. Being a nocturnal animal, the Coral Banded Shrimp greatly prefers the protection of a cave or overhang during the day. In an aquarium, they do best if they have a place to hide during the day. Shrimps in general and Coral Banded Shrimps in particular are very sensitive to shifts in water chemistry, with drastic changes in pH being a prime killer when putting a shrimp into an aquarium. For this reason, take your time when acclimating shrimps. The drip line method seems to work the best for increasing survival.